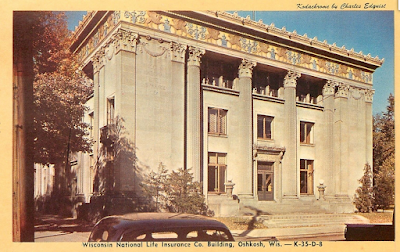 The Wisconsin National Life Insurance Building is located at 220 Washington Avenue, Oshkosh, Wisconsin 54901. 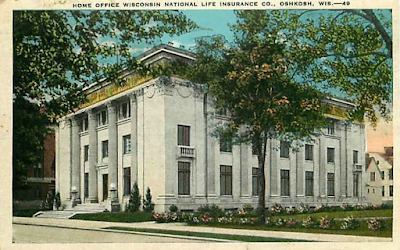 Additional Information: Although the basic classical form of this building appears in other Oshkosh structures (see Masonic Temple OS 10/14 and Northwestern Office OS 10/19), the ornament makes this unique. The entrance is situated between colossal engaged Corinthian Columns. Corinthian Capitals also appear on the pilasters surrounding the building. 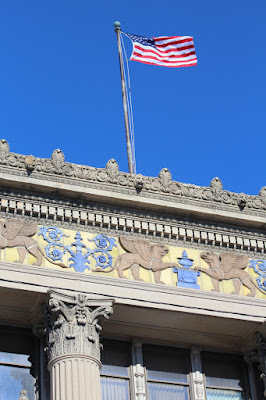 An elaborate yellow and blue terra cotta frieze, consisting of mythical figures, crowns the building and serves as the focal point of the building. The Wisconsin National Life Insurance Co. was chartered in 1908 as the first legal reserve stock life insurance company in Wisconsin. This is a form of life insurance company which has since become more prevalent. It is also significant in that it is associated with life of General Charles Ruggles Boardman who served as President from 1916 to 1946. 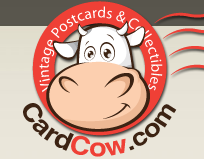 He was also the original Vice-President when the company was formed in 1908. Boardman's prominence comes from his military career. He was adjutant general of the Wisconsin National Guard from 1897 to 1913 amd is credited with organizing the Guard for its role in the Spanish-American War and, later World War I and the Mexican Border Campaign. In 1917 he had his active commission renewed and, as Brigadier-General, led the 32nd Division in France in World War I.
Exuberant ornament and fine proportions distinguish this reinforced-concrete Beaux-Arts Classical building, designed by a local firm. On each of the three principal elevations, recessed engaged colonnades are set between piers that form the building’s corners. Auler and Jensen enhanced the design with lavish details: colossal engaged columns in the Composite order; a terracotta frieze of griffins, urns, and foliation rendered in brown and blue on a yellow field; and a cornice with a cresting of lions’ heads, palmettes, and more foliation. Between the columns, at the third story, rows of stone owls perch along a recessed ribbon of windows. The interior features an opulent coffered ceiling and a border of acanthus leaves and scroll brackets. Swags, urns, and medallions in low relief cover the wall surfaces. Pompous edifices recalling imperial Roman power and grandeur were popular for financial institutions in the early twentieth century. Bibliographic References: (A) Karsteadt, Oshkosh 100 Years a City, p. 176-177. 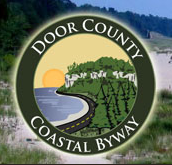 (B) Telephone conversation with Dorothy Rulard, Presidents Office - Wisconsin National Life Insurance Co. (C) Titus, Wm. H., History of the Fox River Valley, Chicago, 1930, Bio sketch of Boardmamn. (D) Buildings of Wisconsin manuscript. 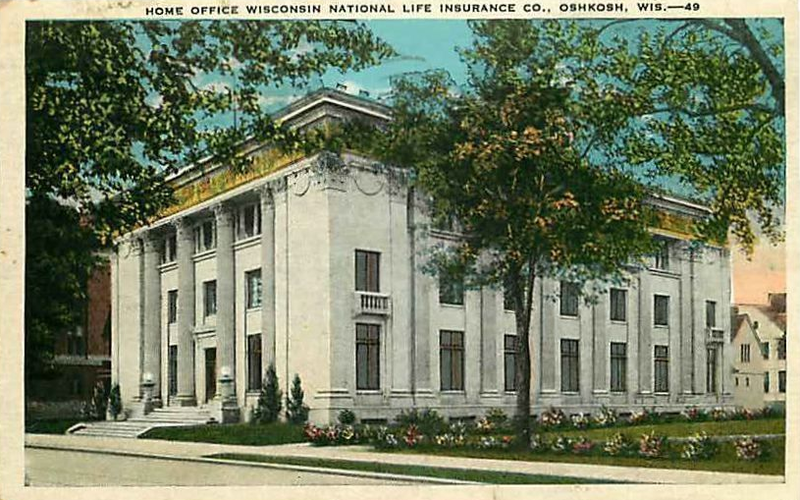 Home Office Wisconsin National Life Insurance Co. Oshkosh, Wis.
Wisconsin National Life Insurance Co. Building, Oshkosh, Wis.